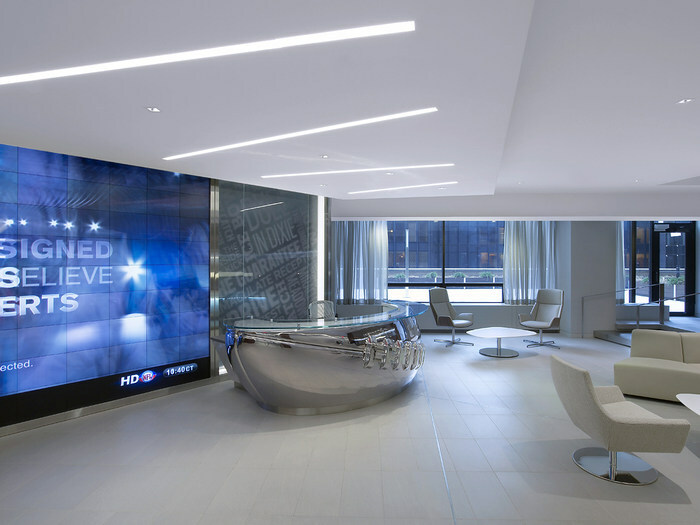 Ted Moudis Associates teamed up with the NFL to create a new headquarters for the organization at 345 Park Avenue in Midtown Manhattan. “One of the NFL’s most important goals for the project was to carry its strong brand identity throughout the design. 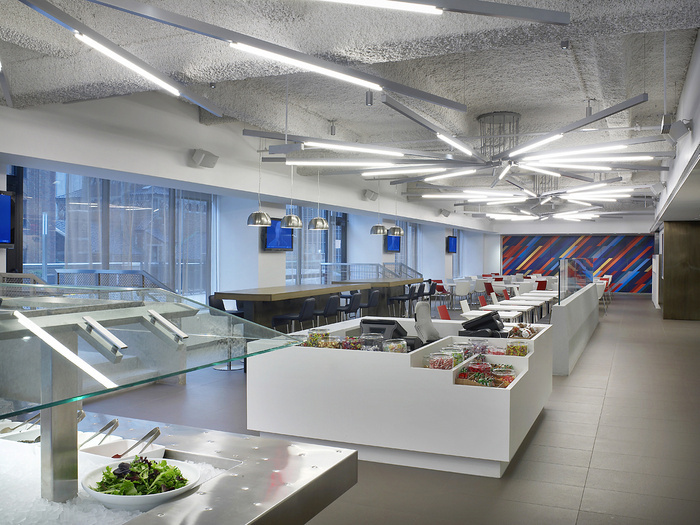 Our team worked closely with the NFL’s Creative Group to develop a design that celebrated the NFL Brand while providing the organization with an amazing workplace. The program included general office space, conferencing facilities including a League Room for owners’ meetings, an employee cafeteria with full cooking kitchen, an interconnecting stair between the four main office floors, a multipurpose room that supports both medium and large scale functions, a fitness center with locker and shower facilities, and an employee store. Each of the organization’s floors is a representation of one of the “Four Pillars” of the NFL: The Game, The Teams, The Fans, and Innovation. The architectural finishes, furnishings, and graphics change on each of these floors to emphasize the floor’s theme. The heart of the organization can be found at the center of the 5th floor, where the Officiating Command Center is located. There are also two outdoor terraces on the 6th floor; one adjacent to the main reception area and the other as an extension of the employee cafeteria. The Design team prepared test fit studies that helped the NFL understand how different planning approaches could affect the overall efficiency of the floor plan as well as the quality of the spatial design. With these plans, we were able to help the NFL establish new standards that provided them with a flexible plan that allows them to continue to change and grow over time. By bringing the majority of the offices to the interior and maintaining collaborative zones at the corners of each floor, we were able to maximize the amount of natural light that reaches the workplace.